On March 29, Oregon Gov. Kate Brown named Bev Clarno, a former state legislator and rancher from Central Oregon, as the new Secretary of State, following the death of Dennis Richardson in February. In announcing the appointment, Brown alluded to Clarno's "trailblazing spirit" and her "commitment to Oregonians." Clarno was sworn in April 1 at her home in Redmond. The author's children, Molly Dugan, left, and Daniel Dugan, right, in 1991, on the day they served as legislative pages for now-Secretary of State Bev Clarno, center. Amid her busy schedule, I caught up with Clarno to look ahead at her plans for the office, as well as taking a trip down memory lane. "I am very proud to be a Central Oregonian serving the state—again, and proud to be a voice for Central Oregonians in Salem once again," Clarno said. Now age 83, Clarno added that she's hoping to set an example for older Oregonians by showing that age doesn't matter, and that everyone has something to contribute. I've been acquainted with Clarno since before she went into politics, back when I was a practicing attorney and Clarno worked in the Deschutes County Courts. As a working parent, my children sometimes accompanied me to court, which is where they met Clarno—one of those court personnel who I felt was truly dedicated to her job and always pushing to be as competent as possible. Later, in 1988, voters in Redmond elected her to represent District 55 in the Oregon House of Representatives—the first woman to do so from east of the Cascades. She served in that role until 1997, becoming Speaker of the House from '95 to '97. Later, she'd be elected to the Oregon Senate, representing District 27 from 2001 to 2003. While she was in the Oregon House, my children, Molly Dugan and Daniel Dugan, served as honorary pages for her during the 1991 session. 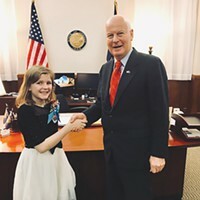 Following Richardson's death to brain cancer, Gov. Brown announced her search for a new Secretary of State. The appointee would need to be a Republican, the same party as Richardson. When she read what the Governor was looking for in a new Secretary of State, Clarno said, "The criteria fit me to a T." Clarno—a Republican—said she contacted the governor to let her know she was interested. When I asked her why she had accepted the Secretary of State appointment, Clarno said, "I worked with Governor Brown before and I have always worked well with her." 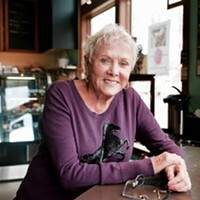 Clarno cited her service in the Legislature, including legislative audits, her election experience, the fact that she'd worked in an investigative capacity for the Corporation Commission before it was part of the Secretary of State's office, and her experience with the Oregon Historical Society, as a few of the areas indicating both her interest and qualifications. She went on to say, "It is my intent to approach this position with transparency and accountability like Dennis (Richardson) did." Shortly following her appointment, Clarno dismissed three of Richardson's top staff members. "My sole motivation was to build my own leadership team with folks who will share my goals and objectives," she said, indicating that she felt it was particularly important in a situation such as this. While she's moving forward and assembling her own staff, she acknowledged, "It is not easy sometimes, in a situation like this, for staff to transition."